The RSF protégé delivered a perfectly controlled drive to keep Carlin's Antonio Giovinazzi and Van Amersfoort's Charles Leclerc at bay for the entire race. Dennis took full advantage of pole to lead the pack away, leaving fellow front row starter Leclerc to scrap it out for second with Giovinazzi. The Italian, who had got the better of Maximilian Gunther off the line, won that battle squeezing past the Frenchman moments later to latch onto the back of Dennis. The three - in a league of their own - then pulled away from the rest of the field with Dennis controlling two restarts to take the chequered flag just under seven-tenths clear of Giovinazzi who was followed over the line by Leclerc. "I'm happy with that," he said. 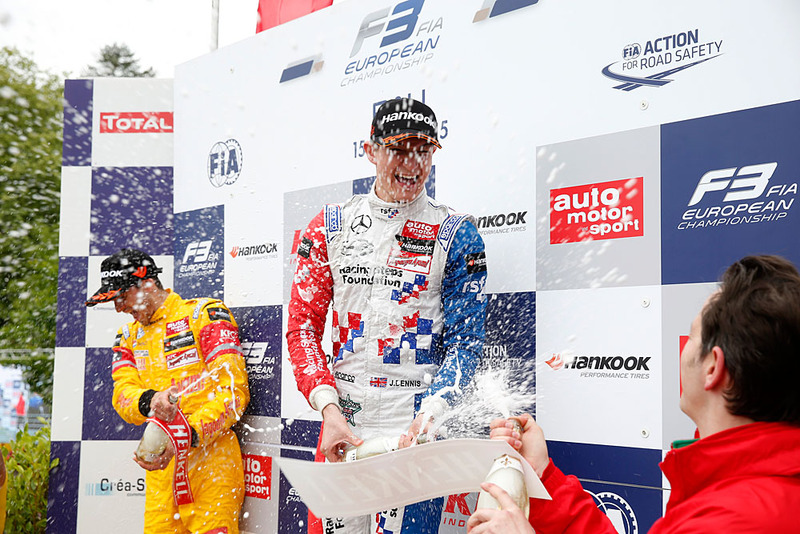 "To get my first Formula 3 win around the streets of Pau is amazing. It couldn't be better. "There was a lot of pressure to soak up, especially with the safety car coming out twice, and Giovinazzi and Leclerc so close behind. "With only around six-tenths or so between us, one mistake from me and they'd have been through. "But I stayed focused, played it safe through the corners where I knew they couldn't pass, looked after the car and then pushed in the corners where they could make an attack. And thankfully it paid off for me. "I'll try and do precisely the same in race two now."